Arduino + LCD demonstrating the 4008 IC Full Adder ! The 2 red DIP Switches are the 2x4 bit inputs and the 5 LEDs are 4 bit output + one LED for the Carry out bit! In electronics, an adder or summer is a digital circuit that performs addition of numbers. 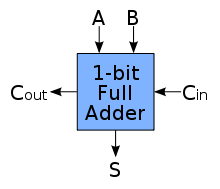 In many computers and other kinds of processors, adders are used not only in thearithmetic logic unit(s), but also in other parts of the processor, where they are used to calculate addresses, table indices, and similar. Thermo/light/door alarm with adjust. temp. threshold! Arduino Robotic Arm with Ir sensor! My first Robotic Arm ! أن تقولَ لنا أن نكون. قد نتلامسُ، نحبُ ونوضح . بقلم جون أشبري: شاعر وناقد فني أمريكي ولد في عام ١٩٢٧. نشر أكثر من عشرين ديوانا شعريا وحاز على أغلب جوائز الشعر الأمريكية حيث يعتبر من أبرز الشعراء الأمريكيين. يتسم شعر أشبلي بالإنسيابية واستخدام الطباق بشكل واسع في بناء جمل موسيقية.